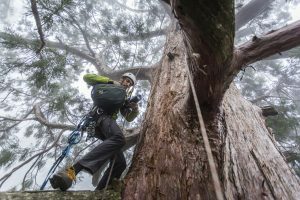 How Dave Katz became a professional Tree Climber, Environmental Conversationalist, and Adventure Photographer. A Mountainsmith Ambassador Spotlight. Looking back on my childhood, my favorite memories were of those I spent with my family in the outdoors. Central New York, and particularly the Finger Lakes region has some fantastic and well hidden gems for great day hikes. After the summer of my junior year in high school I bought my first backpack and tent which would allow me to spend overnights in the forest and in general explore a bit more off the beaten track. When I went off to study at university, I knew I wanted to study Geology, as that was one of the subjects that offered the most field trips. Besides the formation of the various landscapes on earth, I started becoming more interested in ecosystems and I enrolled in as many ecology courses as I could. When I graduated college in 2006 I moved to a small village in Costa Rica in the edge of vast tract of tropical rain forest where I began a year long study on the localized effects of reforestation on micro-climate. Part of this study involved installing humidity and temperature sensors in the forest canopy. As our institute grew at Cornell, we began to accumulate more collaborators and supporters. 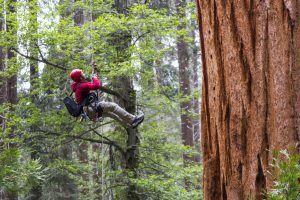 In 2010 we began a multi year study with the University of California at Berkeley’s Center for Forestry in the giant sequoia forests of California. The project incorporates a few of my favorite things in one awesome bundle: forests, climbing, exploration and research. This year, I took some time to reflect on the last decade of climbing trees, exploring forests, and participating in research projects. With the help of my good friend and fellow filmmaker Nat Goodby, I made this short film to help convey some of my sentiments. P.S. Our research project has been featured on the television documentary “Yosemite” on PBS Nature here, and one of my other films “Exposure” looks at climbing Sequoias from another perspective which you can see over on my Vimeo Page here. 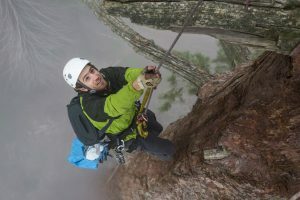 Dave Katz is an adventure photographer / videographer, environmental conservationist, tree climber, Mountainsmith Ambassador and much more.